A black and white photo of a bride and groom signing the katuba. I had never shot a wedding and had a reception all in one place. Jennifer and Jon were married at a Temple Isreal on Longwood Ave in Brookline. The location was all in one, which really surprised me. It was a reception hall and a beautiful one at that. 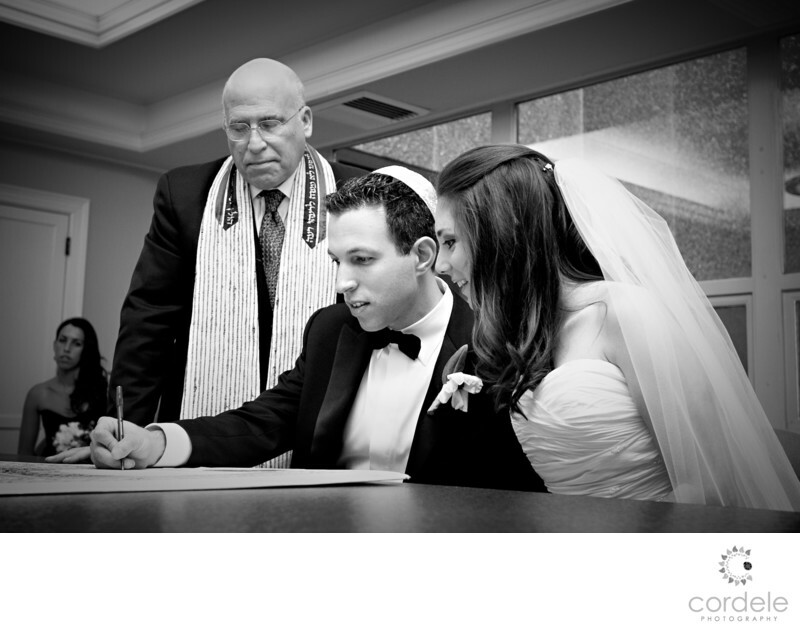 They signed their Katuba in the hall and then went off to the synagogue to get married. This building was enormous. The floors were made of marble and the locations to shoot where endless. We ended up shooting the bridal party outside on the front stairs. I was so happy we had the space because they had a pretty big bridal party. We also had the best cake I have ever seen. It was made by Bruce Silberlief and it was a gorgeous gold and white cake. I had never seen anything like it. This couple was so cute signing their marriage contract and having the photo in black and white adds an element of timelessness to it.